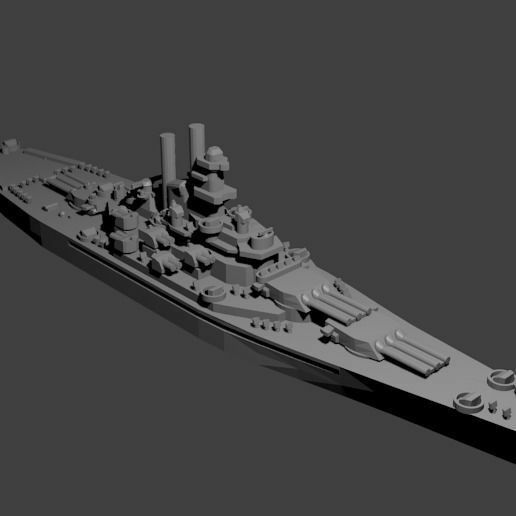 1/1800th scale Nevada Class Battleship model. Certain elements not to scale. The Nevada-class battleships were a set of two battleships, the Nevada and the Oklahoma. They were built during the first world war, and modernized in the late '20's. Both ships were present during the attack on Pearl Harbor. Oklahoma was sunk at her moorings, while Nevada beached herself to avoid blocking the harbor entrance after she became too damaged to escape. Oklahoma was too damaged to repair, Nevada was modernized and served throughout the rest of the war. This model depicts the modernized version of the Nevada.